Thank you to Staffie Supporter Matthew Benjamin for sending us the link to an interesting article posted recently by the BBC. Research by BBC News shows Staffordshire bull terriers are the third most popular dog in the UK. But why are they considered by some as the “chav dog” of choice and what does this tell us about British attitudes to class? Bred originally as fighting dogs, the reputation of the Staffordshire bull terrier often precedes it. And when the BBC’s Dog Map appeared on 18 January, a fierce debate broke out on social media. Painted by many as aggressive, vicious and worthy of a place on the “dangerous dogs” list, every negative view was in turn met by a barrage of positive praise citing the breed’s loyalty and affectionate character. “No surprise to see Staffies popular in big cities where gangs of chavs live and people use them to guard homes,” said one user. So why do the dogs have such a negative reputation? And why do we judge in the first place? “They’re one of those breeds that has a negative stigma attached to them and one of those is around ‘chav culture’,” said Dr Thomas Fletcher, a senior lecturer at Leeds Beckett University. “You hear stories about dangerous dogs and [people] being mauled and a pattern emerges about the type of breed that’s [involved]. “It comes down to social norms and the expectations – who should be walking the dog and what we associate with certain people, than the breed itself. Elvira Meucci, campaigns director for the Dogs Trust, said dog choice and image extended beyond Staffies and “chav culture”. “There’s no doubt that you’re saying something about your personality [with your dog],” she said. “Staffordshire bull terriers are powerful-looking dogs and therefore they can be used to portray their owners as strong and macho, just as a Chihuahua is the choice of girls who want to look trendy. Staffordshire bull terriers are not banned under the Dangerous Dogs Act, but are often confused with banned breeds like pit bulls, Ms Meucci added. That being said, Staffies have made headlines for aggressive acts. In 2011 a girl’s pet Chihuahua was mauled to death by four Staffies while a dog owner was given a suspended sentenced in 2013 after his dog decapitated another dog. The same year, teenager Jade Anderson was killed after she was attacked by four dogs in Greater Manchester, two of which were Staffordshire bull terriers. But Coroner Alan Walsh told her inquest the problem was not specific breeds, but the control of dogs in general. According to microchipping data, 356,000 Staffies have been tagged in the past decade by pet registration companies. The statistics perhaps fly in the face of concerns that Staffies should be given a wide berth. But being the dog de jour is a double-edged sword, with over-breeding, a saturated market and owners who do not commit long term contributing to the number of Staffies ending up in shelters. In 2013 more than a third of the dogs that came through the doors of Battersea Dogs and Cats Home were Staffordshire bull terriers. Bill Lambert, from the Kennel Club, said Staffies are not naturally aggressive and were one of the only breeds it recommended as suitable around children. “We have seen enormous growth in the popularity of Staffordshire bull terriers in the last 20 years and there’s no doubt that some of that has come about because of an increase in status dogs,” he said. “However, the fact is that they’re a dog that doesn’t deserve the image it’s been given. They need a lot of socialising when they’re puppies, but that’s down to the owners. On 20th November, Ellie Haines, a dog trainer from Milton Keynes is taking the challenge of cutting her hair very short and getting it dyed bright pink! in support of our friends Senior Staffy Club, helping older Staffies. Ellie works really hard to help animals and rescues so let’s show her our support by sending donations (no matter how small) to sponsor her in this event. My name is Ellie Haines and I am a dog trainer from Milton Keynes. I am owned by 7 dogs, 3 of which are from rescue centres and two a re-homes from the pound and a re-home from another owner. Staffies are a breed very close to my heart as I used to look after one as a child/teenager for a family friend called “Oscar”, he was fantastic and could snore for England. This is where my love of bull breeds started, I love their funny characters and bulldozer qualities. They certainly try to find the love and happiness in everyone, Staffies can always make people smile. I feel so sad for those without homes, especially the oldies as they should be in the warmest of houses, with the comfiest of beds, with the kindest owners. It saddens me to think of those Staffies who have been booted out when they get to an older age, or when they are no longer useful to their “owners”. I love the work that Senior Staffy Club does for the older Staffies, they work so hard to find space for as many as they possibly can, they are amazing people and I truly admire them. I want to make a contribution to help and have been looking for an “image change” for a while as I have had long blonde/brown hair for years!! So I thought a much shorter hair style with very bright pink hair in the name of helping SSC!! If all of my family and friends could donate just £2 this would go so far to helping with the cost of saving these lovely dogs. They need that £2 so much more than you do and if you can pledge more that is fantastic. We’re thrilled that Lucky 13 have offered to do this to help us help Staffies and we’re so grateful to them (thank you guys!). Spaces are limited so call the studio on 01162 700 558 to avoid disappointment on the day. If you’re in the area or know anyone nearby who might like to get inked and help Staffies at the same time, please share this page and spread the word! “We at Lucky 13 Tattoo, are supporting Staffie Support by tattooing number 13 tattoos for the incredible bargain of £13! Please understand that only the designs on the sheets in the studio will be tattooed. This is so our artists can do as many tattoos as possible. No alternatives will be done and people are limited to a maximum of 2 tattoos. This is an opportunity to have a small tattoo to support the charity not a cheap way of finishing your existing work. 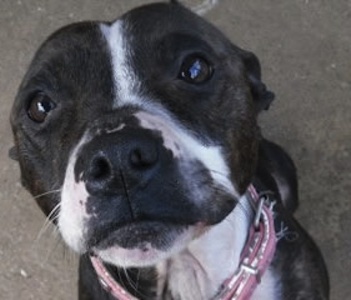 Staffie Support event – Sunday 20 November 2011 at Pets at Home, Fosse Park, Leicester – come and support us!